Our Single Store Edition is designed for stand-alone boutiques and includes all the tools you need to operate your store including: Purchase Orders, Receiving, Create and Print Barcodes, Physical Inventory, POS, Invoicing, Layaways, Returns, Store Credits, Customer Relationship Management, Split Tenders, Sales Analysis, Inventory Replenishing and over 450 reports to help you better understand your business. XpertMart POS is designed specifically for shoes, clothing and sporting goods retailers since it uses a Style/Color/Size1/Size2 matrix to display sales, stock and other critical information. You also use this matrix to enter quantities in every transaction, including Purchase Orders and Receipts. XpertMart POS is the only software package that will help you optimize your inventory at the size/color level. Use XpertMart to keep an eye on your Vendors: make sure that the merchandise they send you is exactly what you ordered. Use XpertMart's audit function to keep track of your Merchandise. Every change to inventory is recorded, along with the date and document number you can lookup. Use XpertMart to reward Employees with commissions and keep sensitive information out of their hands with our Security module. Every employee who logs-in to the system will only have permission to do what you've allowed in the configuration. Use XpertMart to understand who your best Customers are, what they buy and what they spend. Pamper your best customers with special discounts and price lists. Find out when was the last time they were in your store and mail them a coupon. Everything you need to turn your computer into a Point-of-Sale station and run your store at an incredibly low price! All of the devices are guaranteed to be compatible with XpertMart POS Software and work with each other, saving you the hassle of having to shop around. Note: Paper rolls and barcode labels sold separately. Our Multi-Store Edition includes all of the functionality of the Single Store Edition plus a whole suite of tools you need to run a chain of stores, including: Integrated Communications Module, Task Manager, Transfers, In Slip & Out Slip Matching, Auto-Transfers, Inventory Balancing, Multi-Store Purchase Orders and the Reports Designer. 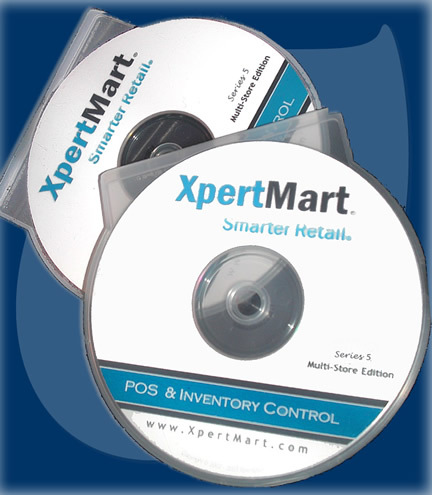 With XpertMart Multi-Store Edition you can run your entire chain of stores as a single store. Each store automatically sends its data to a Main every day and has updated stock information for the other stores in the chain. XpertMart automatically suggests Transfers to move merchandise from stores where it is not selling to stores where that same merchandise is running low or out of stock. XpertMart is the only software that will optimize your inventory both locally (at a store) and globally (across the chain). Note: you need one Multi-Store license for each store in your chain, plus you need another Multi-Store license for the Main office. Example: if you have 10 stores, you will need 11 Multi-Store licenses. If you have already bought the Single Store Edition and wish to upgrade to the Multi-Store Edition, you only need to pay the difference between the two. Add as many additional workstations as you can link together in a network. Great for that extra sales terminal or for the office/warehouse at the back of the store. Users can be online concurrently. All changes made by one user are instantly seen by the other users. Copyright © 2000-2003 XpertMart. All rights reserved. XpertMart| T: (954) 688-3045 | E: sales@mac-pos.com.